Lee Anne and I first met at an awesome midwifery we’ve both used, when I was pregnant with my son in 2014. It was one of those instant-soul-friend-connections. It wasn’t just over our shared passion for photography or our faith walks, but so many more things. Little did I know, I would be working alongside of her with Petal & Vine a few years later! Ever since this lovely lady shared that she was expecting, I couldn't wait to photograph this time in her life! I had been hoping for this family to welcome a new little one for several years, ever since I knew it was a desire of their hearts. When I asked about a location, Lee Anne immediately said, "We've got to do them at Bok Tower! That's one of our favorite family spots". And so we did- and it was beautiful. Here's to their next adventure as a family of FIVE! 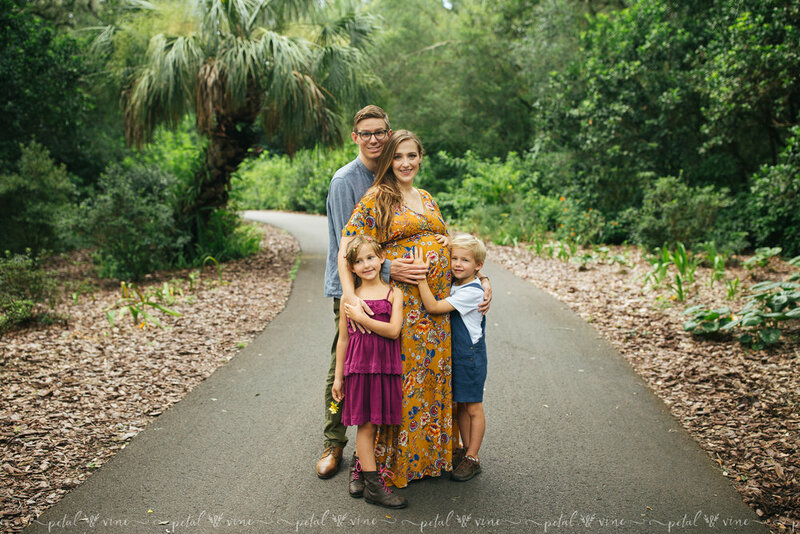 Please contact Petal & Vine Photography if you're interested in booking a maternity or family session in Central Florida, in areas such as Lake Wales, Lakeland, Winter Haven,... or surrounding areas such as... Tampa, St Pete ,Dunedin, and more. We can’t wait to hear from you!